Adjacent rooms, connecting rooms or specific room location and types of rooms or bedding are on a "request basis only" and are subject to availability at the time of check-in. These requests for specific room type or location may result in additional charges to be paid directly to the hotel. Reservations are not transferable, and reservation name changes are not permitted. For cancellations made 2 days to 29 days prior to guest arrival, amounts paid, minus a cancellation fee of $200 per package and minus any cancellation fees assessed by third party hotels or other suppliers, non-refundable air transportation, non-refundable runDisney race registrations, travel insurance premiums and other amounts owed, will be refunded. No refunds are given for cancellation of any personalized products or experiences. Travel insurance premium is refundable within 14 days after the date the insurance is added to the package as long as guest has not filed a claim or guest has not departed on the trip, as more specifically provided in the Travel Insurance Description of Coverage. For insurance added 2 days to 14 days prior to guest arrival, travel insurance is refundable if canceled at least 2 days prior to guest arrival. If travel insurance is cancelled after these dates, the charge for travel insurance premium will be added to the other applicable cancellation fees. For insurance Description of Coverage, please ask your travel agent or visit www.disneyworld.com/travelinsurance. For reservations made 15 days or more prior to guest arrival, travel documents (such as vouchers or certain fulfillment cards, if applicable, or travel itinerary confirming an airline reservation) will be mailed to guests with an address in the United States or Canada within 30 days of arrival subject to final payment in full. MagicBands and certain radio frequency cards are not shipped outside the United States and guests eligible to receive them may pick them up at the guest's resort hotel upon arrival. For reservations made 14 days or less prior to guest arrival and for any reservations made by guests with an address outside the United States or Canada, travel documents will be delivered to the Front Desk of guest's resort hotel. For packages other than Magic Your Way packages, Guests can pick up Disney theme park attraction tickets and certain other fulfillment cards at the guest's resort hotel upon arrival. 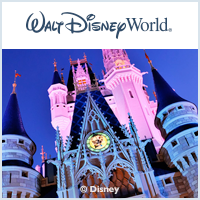 Guests with Magic Your Way packages may have entitlements linked to an account they create online ("Disney account") and ticket and other entitlements will be fulfilled via a MagicBand or radio frequency card. For insurance Description of Coverage, please ask your travel agent or visit www.disneyworld.com/travelinsurance. Consistent with airline baggage policies, Disney's Entities (as defined in this paragraph below) liability for loss of or damage to guest baggage or property arising out of Disney's Magical Express transportation is limited to a maximum of $3400 per guest regardless of the number of bags or amount of property (however, this policy shall not affect the applicability of Fla. Stat. Section 509.111 relating to loss of or damage to guest property at hotels). Disney’s Entities shall have no liability for the loss of or damage to cash, financial instruments, precious metals, silverware, jewelry, works of art, medicine, computer/photographic/video/audio equipment, cell phones or other valuables. "Disney Entities" means Walt Disney World Resort, a division of Walt Disney Parks and Resorts U.S., Inc., its parent, affiliated and related companies, and the directors, officers, employees, subcontractors, agents and representatives of each. No pets will be transported by Disney's Magical Express transportation except for service animals. Complimentary transportation services provided by Disney's Magical Express service are provided to guests staying in select Walt Disney World® Resort hotels and include a one-way ground transfer between Orlando International Airport and guest's Disney Resort hotel on the day guest checks in and a one-way ground transfer from guest's Disney Resort hotel to Orlando International Airport on the day guest checks out.